On a cloudy morning in 1944 the Japanese battle fleet crashed into a small group of American warships called Taffy Three. The USS Johnston turned into the teeth of the oncoming fleet, unleashing a torrent of torpedoes and gunfire. In the smoke, haze, and rain the Johnston was everywhere, fighting off battleships, cruisers, and a whole line of enemy destroyers. Men passed shells up staircases, turned the rudder by hand when the power failed, and fired the guns till the ammunition rooms flooded. When the captain finally ordered the men to abandon ship, the sailors gathered off the stern, but as they rose and fell with the passing waves, they had much more to endure. Sharks pushed their way into the mass of men, and saltwater gnawed at their burns. Meanwhile, rescue craft searched for them…in the wrong place! Who would survive? Tin Can Sailors Save the Day! 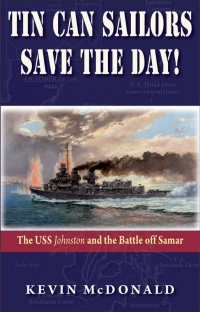 tells the story of the USS Johnston through the eyes of three men who served aboard the ship: Captain Ernest Evans, Gunnery Officer Bob Hagen, and Seaman First Class Dusty Rhodes. Each man has a story of how he became a sailor and how the Johnston became his ship. Not all of them survived, but they all did their country proud.